part iii Sailing Brittany, from Plymouth to l’Aberwach. Plymouth, day iii (my trip) first full day on boat. We will leave today, when Mike’s pal Dave arrives on his train from Manchester, and soon as the afternoon tide allows. We grab a quick bite in town and then have another, more serious, tour of the boat. This time the emphasis is on knots; fenders; and sailing generally, in particular on safety at sea. 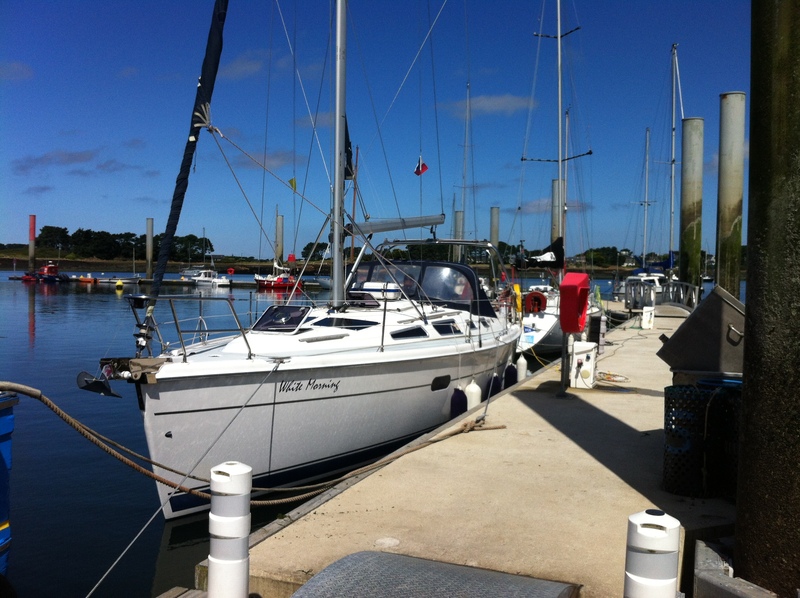 Mike’s boat, the 36 ft White Morning looks sea-worthy, well built, and highly equipped. 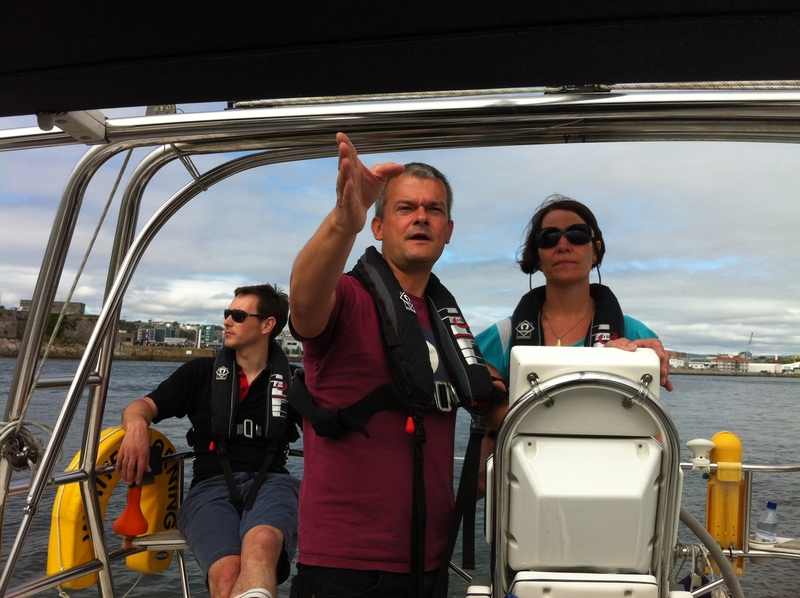 Mike thankfully is a conscientious skipper, who doesn’t mess around or stint on safety. The outfitting of the boat includes radar, modern communication, navigation and safety equipment. There’s a lot of gear, and a lot of info to take in. We learn where the safety hatches and fire escape are. The contents of just one stash of gear, stored below the cot I sleep in, is alone enough to make my head spin. If we get holed on a reef, for example, we have a range of wood, rubber and cork bungs down there, to attempt running repairs, to try and fix the leaking crack in the keel, hopefully before the ship sinks. Just as impressive, a separate water-proof box below my cot holds an arsenalof flares. There are flares you light and hold, and flares you launch into the air. There are different colours, to which signify different messages, or to work better in fog or at night or in bright daylight. My favourite is a monster, orange flare. Apparently this is what we use if we’re airlifted off the ship by helicopter. Yes, that’s right, by helicopter. This flare sends a huge plume of bright orange smoke into the air, then, (wait for it) dyes the sea orange. It’s difficult to describe how impressed I am by all this. Apart from radio, chart desks, radars, bungs, safety fire hatches and flares, further gear all includes a tough life-raft in its fiberglass shell, plus six very modern, hi-tech looking life-jackets, of the self-inflating design. I find all this highly reassuring. There’s no room for complacency about safety at sea. This same very week, in just the 3 days before I left Ireland, the body of one man is pulled out of the water off Kinsale in Co Cork. The same week two other bodies, trawler men on a fishing boat, are raised from the seabed off west Clare. The community down there is in shock. The skipper was an experienced, professional fisherman, as I left, how this tragedy happened was still a mystery. One theory holds their boat sank so fast they never had a chance to get out. It’s a sobering thought. The last member of our crew arrives. Dave is from Newcastle, a industrial product designer, who now lives in Manchester but (of course) retains his Newcastle accent. Dave is a good bloke, and (far more important) hilarious. The voice-over from the dreadful but endlessly popular UK Big Brother series was, of course, Geordie. (For our American or oversea readers, that’s Newcastle). So, all Dave has to do to send us into stitches of laughter is to increase the deep Geordie rumble and say in deepest Newcastle: “Day-4, … and they’re on a booot”. We have our full crew now. There is no reason to hang around Plymouth anymore. Mike fires up the diesel engine. We unmoor. Fenders are pulled up and re-tied at the back of the boat. Finally, we are off. from left to right, Dave, Mike, and Lindsey. The red ensign flutters behind the helm. As an Irishman I find I’ve a slightly odd feeling about sailing a boat with the ensign, a flag that includes (in its top corner) the Union Jack. But I better as the phrases go, get over it or get my head round it. At the giant lock guarding the marina; we get clearance on the radio from the harbormaster. The sea gates part and we motor out to open sea. The piers go past. Up behind them, the giant fortresses on the hills that surround the town. 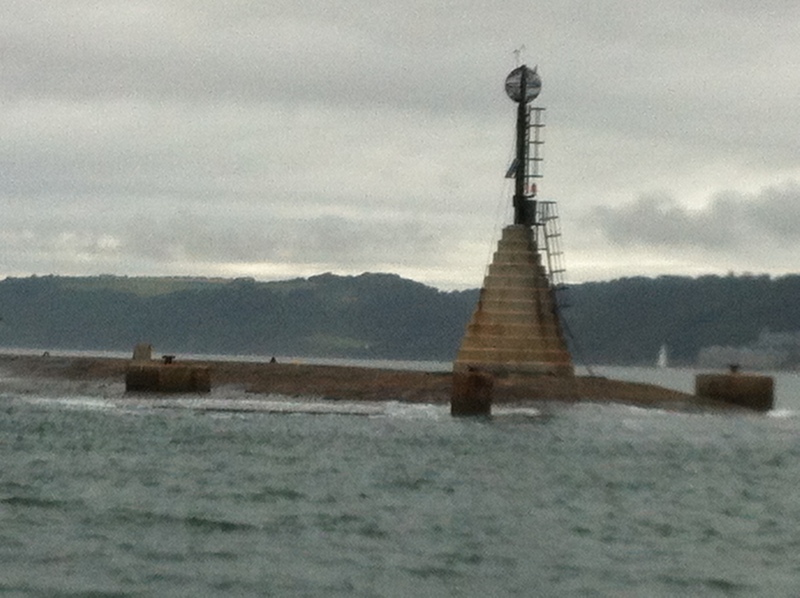 At the end of one sea wall, we sail past a weird looking marker. It has a ball- shaped cage at the top, with a steel ladder leading up to this metal sphere thing. A door opens & shuts the cage apparently. Mike tells us that if a ship was wrecked or went down in a storm approaching Plymouth, if a crewman could somehow swim to this odd cage-ball thing, they were supposed to climb up the ladder and get inside to wait for rescue. The ide was the cage would protect them from being battered to death off the pier or swept out to sea. You can’t blame the admiralty for trying it out. But there seems to be a slight design flaw here. I try to visualize how somebody would get up a heavy iron ladder, while being hit with a powerful wave every 8 or so seconds. My guess is they wouldn’t. But what do I know? When time allows I look forward to a spot of research, into this bizarre invention. Plymouth and land slowly recede into the distance. We really are out on the channel now. Fog descends, shrouds the boat, and land disappears completely. Hours start to pass. We have about 5 more hours of light before the night closes in. But the fog is already here, a thick grey blanket, severely restricting our visibility. We can see gulls fly and bob around the boat, but little else. I’ve read my fair share of Patrick O’Brien, (author of “Master and Commander” and all those other great navy yarns.) It’s interesting now, how after a few hours the seagull thin out, to be replaced with other, hardier species of birds, that can fly out further from land t over real, deep, open water. Seagulls are one of the clues of course, to know if you approach land. It’s interesting to see the clue work in reverse. The feeling of isolation is interesting, thrilling in fact. But as the fog thickens further, and night closes in isolation is not the danger. The danger is big ships. The channel might look small on a map. But it’s big. With the fog especially we hardly see another boat. But they’re out there alright. This is the busiest shipping lane in the world, with dozens of massive cargo and oil tankers criss-crossing every night. At sea, might is right, obviously they can not easily change course and clearly it’s our responsibility to stay out of their way. The key here is two-fold, the watch system, and the radar. Watch is what it sounds like, looking and listening, using your eyes and ears. If we hit a big ship it will smash us to matchsticks and it will kill us, will smash us to matchsticks, pure and simple, very possibly without even noticing. How do I react to this tense, serious situation? I sneak below deck, crawl into Lindsey’s cabin with my sleeping bag and go to sleep. Three days of travel related stress, insomnia, exhaustion catches up with me. I’m hit with a wall of fatigue. This is the cabin right in the prow of the boat. Just before I drop off, I listen to the sound of the hull, surging through the water. The cold seawater, just inches away, rushing past the stern. It’s a strange noise, and a strange feeling, this tiny thin layer, protecting us from the immensity of it all. The sea; the sea, the snot green, scrotum-tightening sea” – I muse, having groped round the sleepy corners of my mind for a further suitable quotation, but finding only that Irish filth-merchant and pornographer James Joyce, amply demonstrating why the Irish Free State was correct to ban his books. And with that final, cultured thought, I fall into a deep, dreamless sleep. Much later into the night, around 3.30am, I wake, and go back up on deck. 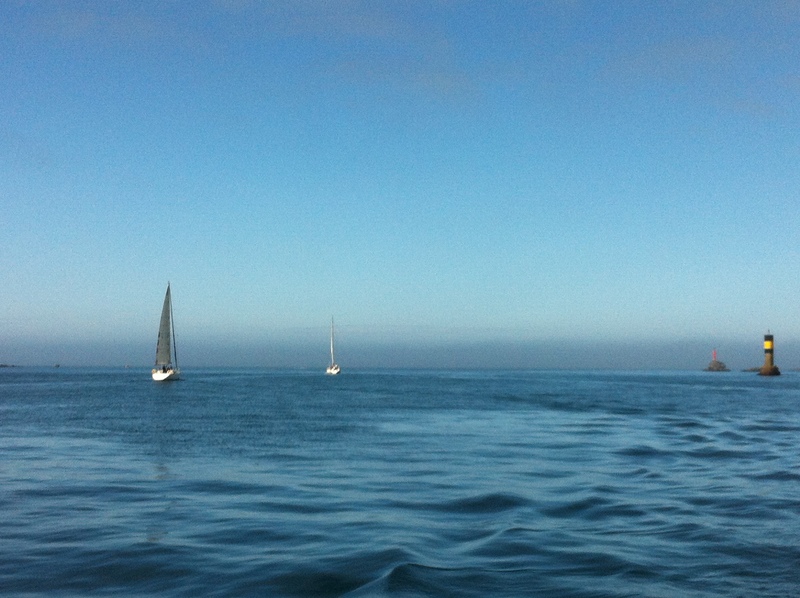 We’ve been sailing about 12 or 13 hours now, and we’re only just over half way across. Now I do my shifts, on watch and on the radar. 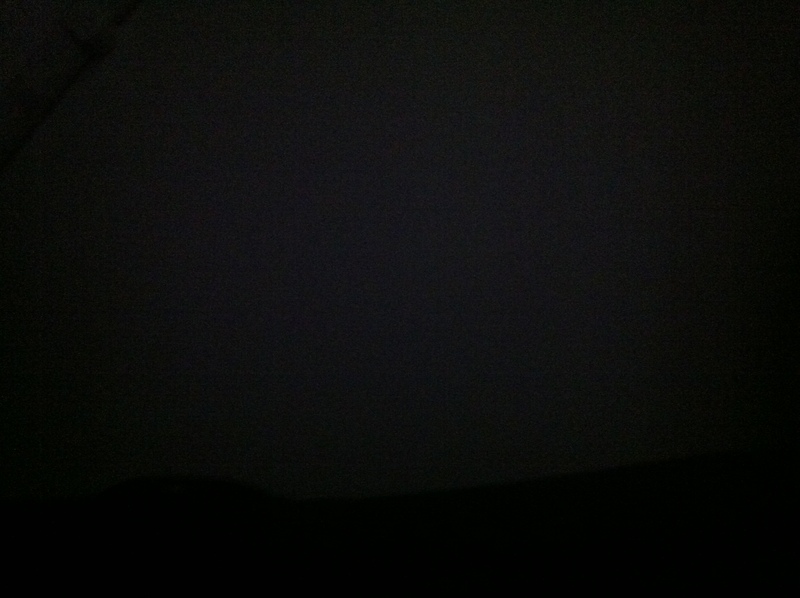 It’s pitch dark now of course. Even the narrow halos of light, from the faint lights we carry are swallowed in the fog. 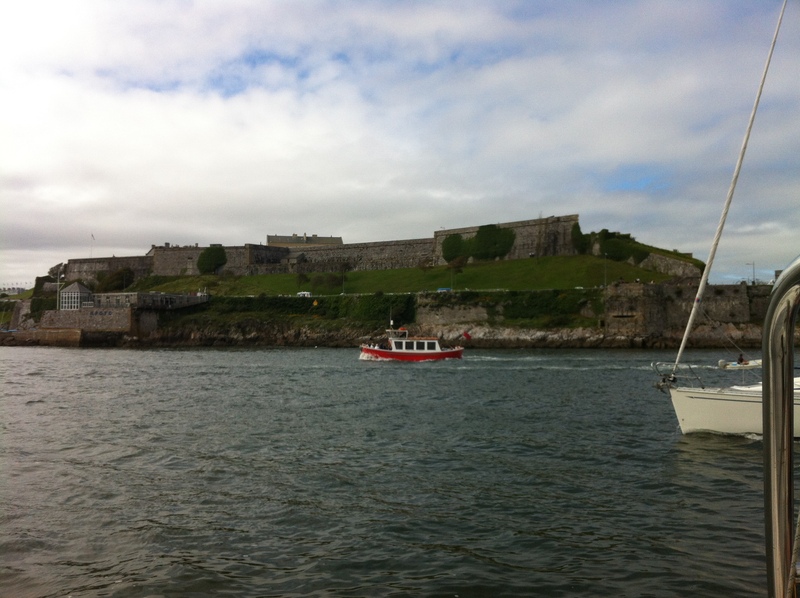 Here is a picture of our view from the boat…. Dave turns out to be a good teacher, explaining the radar, how to use it. My first (unspoken) thought is it looks pretty cool, the concentric rings, the classic outward spread of circles. But I find it pretty scary until I get used to it. Using a button on the computer, you can scale up or down, to change the radius from a half-mile to two mile per ring. What is frightening is the “slugs”, yellow or grey smears creeping slowly across the black screen. These signify craft out on the sea, invisible in the dark and fog. These yellow slugs appear from all compass points, a sort of thin digital smear, creeping slowly across the black screen, with a silent, sinister appearance. They appear at all compass points. There’s a slug, 11 o’clock. There’s another, two o’clock, keep an eye on that please. Why not more lights? -you ask. Say you were sailing a small, fragile craft, through fog, at night, across, say, the busiest shipping lane in the world. You might think in these circumstances, you’d want your small boat lit up like a Christmas tree. That’s certainly my initial thought. But I am wrong. I need it explained to me that’s it’s up to us to see the big ships, not the other way round. Our visibility is not the point here. The imperative is our ability to see others. Anything that detracts from this is out. So, we don’t want photons (light pollution) blocking the view. It all makes sense now. Still bloody terrifying, mind you. The hours pass. The lovely view (above) continues… We keep our eyes, and more importantly ears out for ships. We squint fiercely at the radar. The faintest hint of dawn appears to the east. I’d like to wax lyrical about the pink flush of salmon dawn. But in reality we get a slow, successive lightening, progressive waves, slightly lighter shades, of fog-grey. We have another round, warm mugs of coffee. Gradually the sky lightens further. Mike comes back on deck, after some much needed and well deserved sleep. I think how tiring it must be, having responsibility for the boat and everyone on it. I feel a hundred % better after my sleep earlier in the night. I’d not realized how exhausted I was. We are all up now, sipping coffee, happy for the early daylight. We happy few. The first seabirds start to appear. 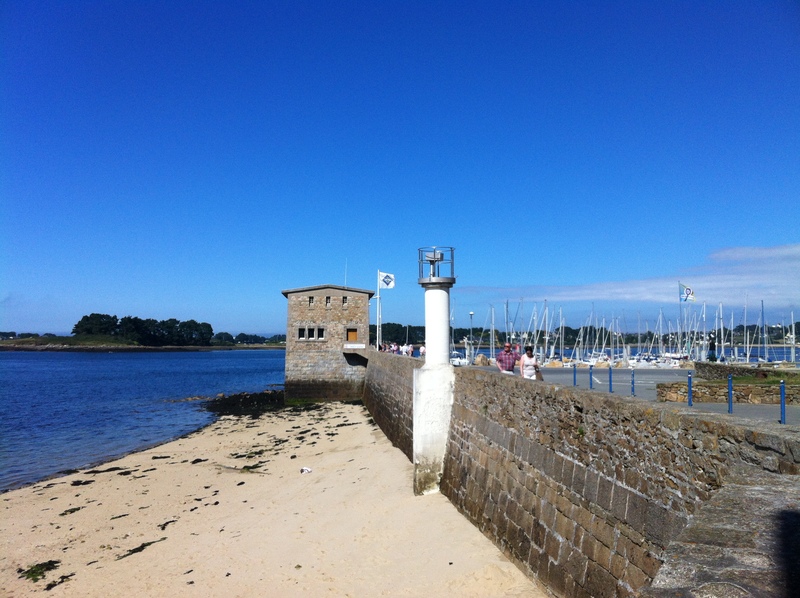 Then markers, buoys and lighthouses of Brittany. The sun is high clear and bright now. We hope to make land ny lunch. Everyone is starving. Although I never managed to get any good pictures of the best ones, some of these lighthouses are spectacular, justly famous in France and around the world. One popular souvenir of Brittany, I’ll later discover, is posters and postcards with a grid of these wonderful, impossible, indestructible, other-worldly constructions. (well worth a search on the internet, for pictures) Quite how some of them were built is beyond me, these huge towers of brick granite, on microscopic rocks in the ocean. How on earth did they transport and land the huge blocks, or erect them into place? The day has arrived now, it is still cold, but the sky is a beautiful deep blue, reflecting off the calm sea. Then, finally, a tiny horizontal line appears, a thin, indecisive smudge . At last we see the coast of France itself. Gradually it becomes larger, and we start to approach the mouth of the river Wach, and to pick out features, a gentle hill, a smudge of trees. Slowly it all becomes bigger and clearer. 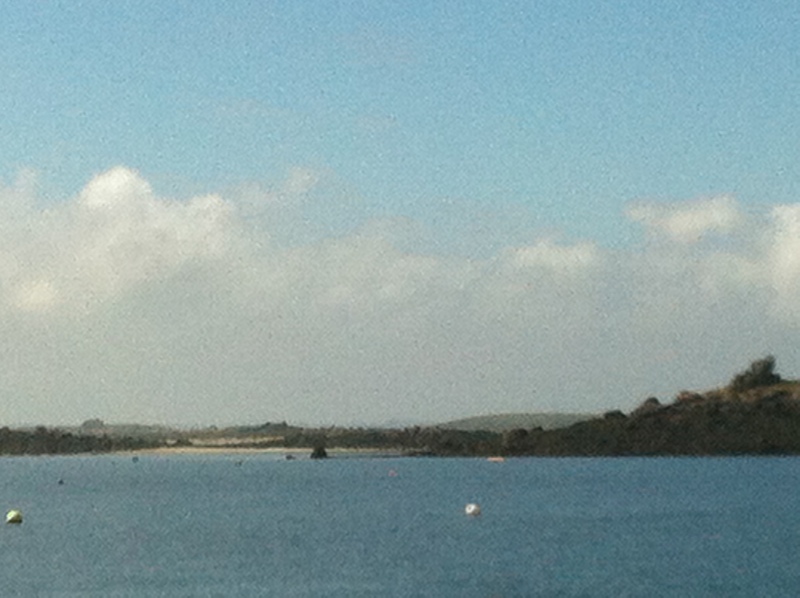 , and further hour to navigate into and up the mouth and estuary of the river Wach. 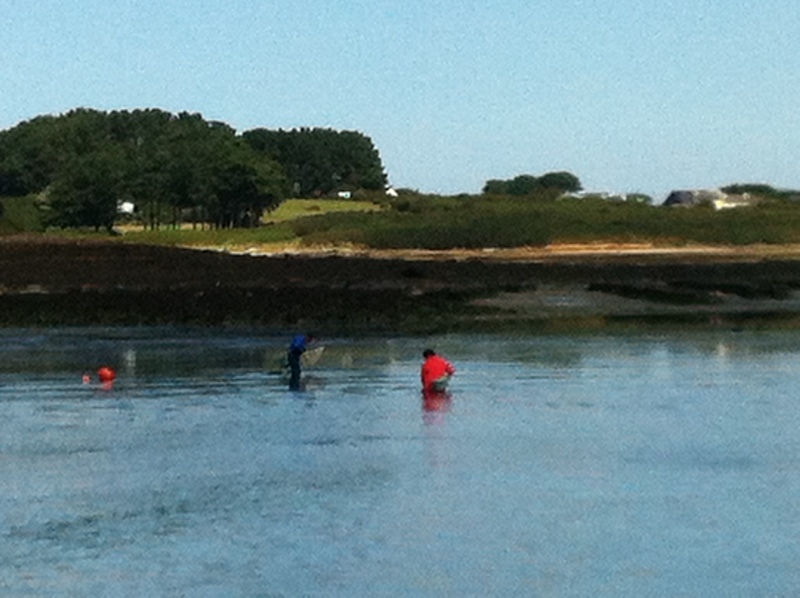 We see see people near the banks, the shoreline, harvesting shellfish, or digging in the estuary mud for bait. … to get to the marina beside the tiny village of L’berwach (the mouth of the Wach in Breton) moor and tie up the boat. White Morning has done well. Just as pleasing it becoming abundantly clear the weather is very different this side of the channel. As if to celebrate, the sun blazes now, burning off the fog, on coast and land at least. The open sea is behind us now. 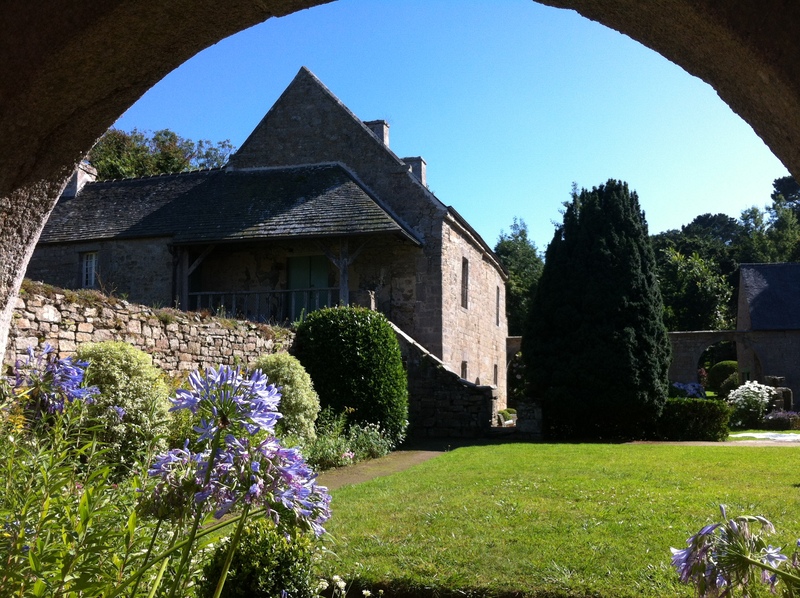 Brittany is beautiful, bathed in glorious, hard, warm sunlight. Nous sommes arrivé. We are here at last. We gorge ourselves on breakfast in a traditional, local café-restaurant, housed in a pretty, solid little stone cottage, so typical of Brittany. Brittany looks beautiful. I look forward to exploring it… but that’s it for now. Thank you for reading, and please come again. Wow, the pictures look stunning. 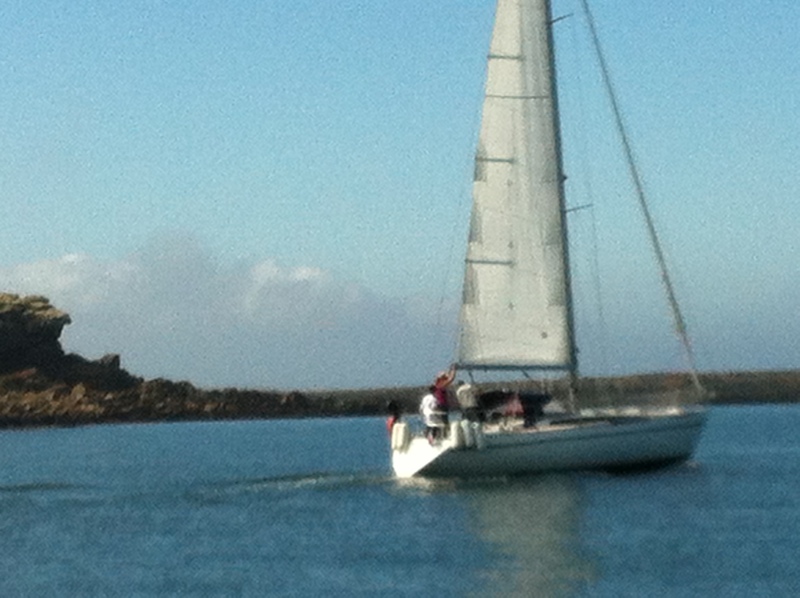 Previous Post Part ii- Dublin to Concarneau and Carnac; a sailing voyage on the coasts of Brittany. 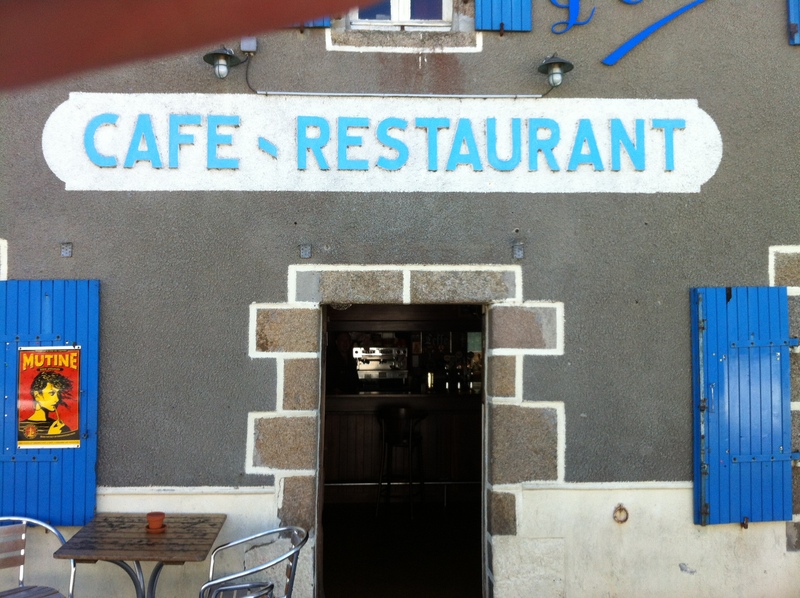 Next Post France at last, Dublin to Concarneau, part iv, L’Aberwrach.